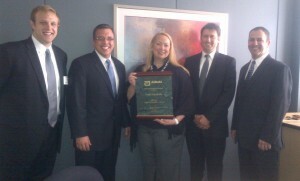 Sarah M. Catterson – Abbott’s Vice President of Global Purchasing, presents Pratt Industries with the 2011 Supplier Excellence Award. Receiving on behalf of Pratt are (from left) Patrick Bengelink (Sales Rep), David Gill (Sales Manager, Grand Rapids), Craig Stucky (General Manager, Grand Rapids) and Richard Turner (Strategic Account Manager). 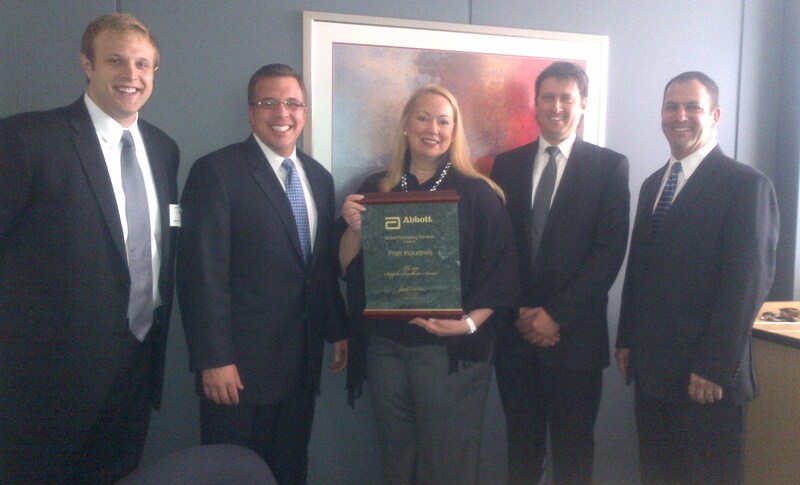 Pratt Industries has just won Abbott’s Supplier Excellence Award for 2011 – the second consecutive year the company has been so honored by the leading health care company. With a supply base of over 23,000 providers, Abbott chose Pratt as one of just 30 companies to be recognized with this prestigious award. Pratt completed 2011 with 100% on-time-delivery performance, 100% quality performance with zero non-conformances, and exceeded all supplier goals for cost reduction and innovation. Abbott said winners were recognized for exceptional contributions, demonstrating outstanding performance and continuous improvement in supplying materials, equipment and services to the company. The Abbott Supplier Excellence Award program began in 1991 and utilizes an assessment process that combines performance data along with feedback from internal stakeholders, including manufacturing, material control, quality, engineering and administrative services. The program identifies Abbott’s highest performing suppliers by assessing performance in the categories of quality, delivery performance, service, cost effectiveness, process improvement and innovation.